IYF Bike Programme encourages cycling and healthy living, develops life skills, creates a sustainable community enterprise, reduces bike crime, promotes creative citizenship, and provides work experience and real job prospects. This project has been particularly successful in engaging with hard to reach young men living in disadvantaged areas. To date young people from our Dublin project have received work experience and jobs. They have also taken part in cycling challenges (Wicklow 100) and supported charity cycles as mechanical teams. So far 240 young people have engaged in the programme & 10 young people are receiving a City & Guilds in Bike Mechanics. This programme currently runs in Dublin and Limerick. Bikes are a symbol of freedom for young people. 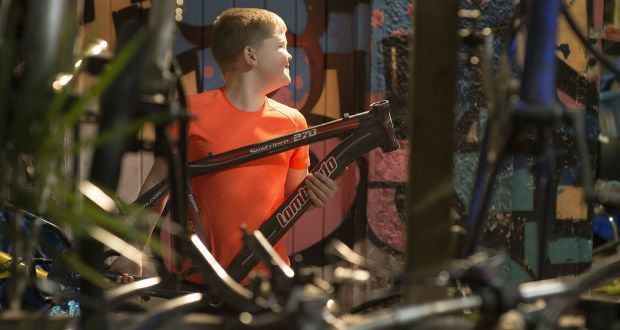 They’re affordable (and if you come to the bike workshop and build one, they’re free) and citizens of Dublin have become accustomed to seeing groups of teenagers navigating the inner city balanced on one wheel.